This post is a little different from the norm but I thought I would review a Pinterest attempt that actually worked, as I have had several failures lately. 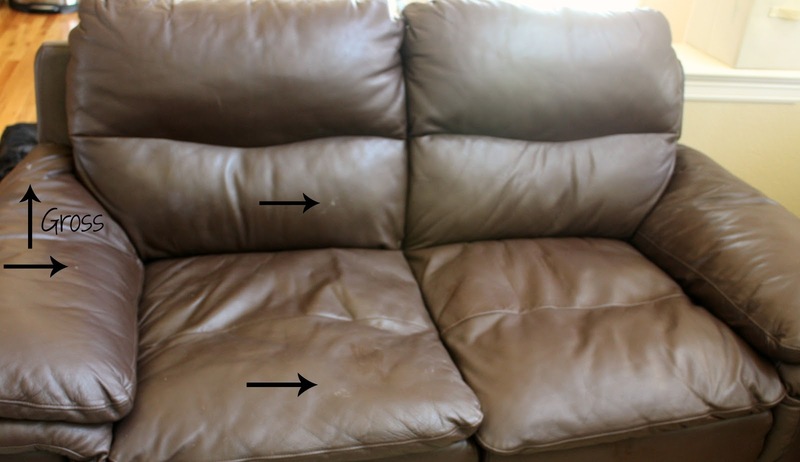 We have some leather couches that honestly wouldn't be my first choice for furniture, but they came with my husband when we got married :) I have tried several times to clean them with no luck. After having two kids and a dog there is just stuff on them. 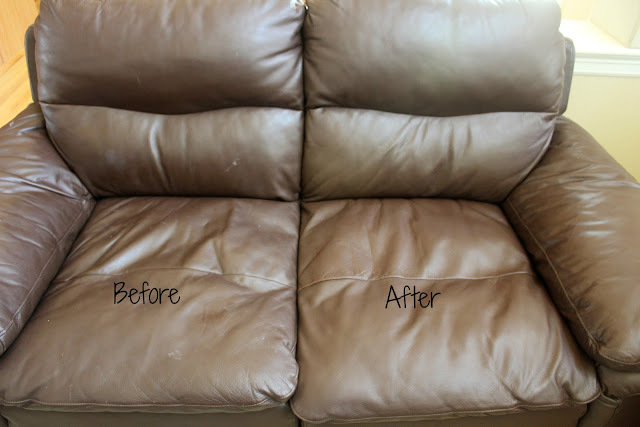 I found a pin about cleaning leather sofas from www.stepbystep.com. I was a tad skeptical because I guess I never knew you should clean leather with ivory or another mild body soap. I used a Dove body wash and it worked. Here are some pics but they don't really do it justice. I don't have before pics of the after side, but trust me, it was just as bad as the other side. The wash really took off marks that I had gone over before several times with a damp rag, leather cleaner, and other failed attempts. So if you are looking for an easy way to clean that actually works, I would totally recommend this cleaning method. Nice sofa! Thanks for sharing nice pics. Personally, I wouldn’t opt for a leather sofa either. It is a special material which needs special maintenance as well. This is why the mild body soap works for this. Strong carpet cleaners are more likely to leave fades or stains, which is counterproductive just the same. Peut être utilisé pour la robinets vente autre option est une finition métallique. L'un des types les plus populaires de métal est le cuivre, car elle est le robinets cascade et la lutte contre la rouille, mais elle exige un revêtement transparent, pour garder son lustre et peu d'entretien. D'autre part, le chrome n'est pas robinetterie baignoire transparent rester attrayant, et il est aussi difficile et sont généralement moins chers. Le nickel est, elle ne nécessite pas beaucoup d'entretien de l'autre type de métal, il est à la fois durable et moderne. Pour robinets pakistanais une surface robinets LED particulièrement populaire est fait d'acier inoxydable, le plus souvent parce qu'il est économique, durable, mitigeur douche , mais elle ne nécessite un détergent spécial pour plaine.